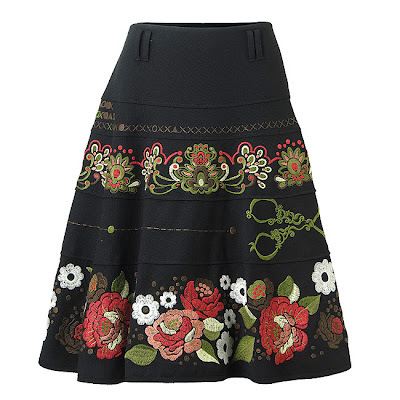 I recently went into one of their retail stores and found a woman's skirt that was to die for. I instantly fell in love and to top it off it was on sale marked down 25%. I have to admit my heart skipped a beat. I searched eagerly for the tag and did the math. Again, I have to admit that with such big numbers it got a little tough to do the math. The total came to $298. My heart sank. I would never spend that amount no matter how cute the skirt was. Maybe I'm not a designer woman but even at 50% off I wouldn't buy it. It's just too much for a skirt. I'm frugal remember! I like a screaming deal not a layaway plan. I admired the skirt but did indeed make the slow and painful steps out the door. I quickly glanced at the sales girl and she read my face immediately. She smiled and said, "maybe next time", with a shrug. Yeah right chica!!! Do I look like the rich and famous. Oh yeah.....and this is the skirt. Isn't it beautiful. What would you pay? do one like it for you on a plane black skirt. Time for a trip to mexico? Maybe that way you feel justified in spending $300 on a trip and way less on a hand sewn skirt. It is beautiful. Hope your doin' well, miss you! Beautiful...and I would never pay half that either! Even if I were independently wealthy! Sheesh!